I’ve been playing games for a very long time. I remember the simple days of text adventures, such as Zork, early graphical expositions like Oregon Trail, and the heyday of point and click adventure games like Maniac Mansion. Along the way video game storytelling has evolved and progressed into multimillion-dollar affairs where motion capturing, expansive set pieces, and exquisite dialog merge to form truly interactive experiences. But, much like the movie industry, where independent films like Call Me By Your Name or Ladybird can hang with the big guns at the Oscars, some indie developers have begun to capture our hearts with masterful stories and innovative gameplay – often with a keen eye toward the past to capture a nostalgia that’s often forgotten in the AAA maelstrom of yearly franchises. From classic 8-bit Metroidvanias to the newfound walking simulators, the idea of what it means to be a video game has expanded to the point where we’re playing titles like Subsurface Circular, which at its core is nothing more than a simple text adventure where you get to choose pieces of the narrative, despite it having a very linear story to tell. To be blunt, this game won’t be for everyone – but that’s not necessarily a bad thing. We need some variety to keep things fresh and interesting. As with any good book, this game comes down to its writing and the story it has to tell. The game is designed to be a one or two sitting experience – you should be able to beat it in about 3 hours. That’s reflected rather fairly in its asking price of $5.99 – less than a ticket to the movie theater. So, what’s the game all about? It’s set in a distant future where robots are now the working class. You play as a detective who is always riding the subway, which is aptly called the Subsurface Circular. You are stuck on this never ending ride, but you’ll meet a bunch of different robots who step on and off the train at different stops. Right away you get into a conversation with a fellow Tek (robot) and it mentions that a friend has gone missing and asks for your help. Since you’re a detective you take interest in the case, but are conflicted because normally all of your assignments come from the humans up above (also known as management). It’s against protocol to take on new missions by yourself, but as you navigate the various dialogue trees you eventually decide to look into this robot’s disappearance and the game begins. The gameplay loop is a rather simple one – you sit in your train car and interact with the various Teks that sit down next to you. There are a wide variety of job-specific robots that will be vital to you solving the game’s many mysteries. It turns out that humans have not only relegated low-tier jobs like manufacturing to the robots, but even psychiatrists, priests, and professional sports as well. It leaves one to wonder what exactly humans do in the world anymore. I couldn’t help but picture them as fat slobs riding around in automatic chairs sipping from an infinite supply of soda – as seen in Wall-E, but we’re stuck to the tracks in this game. You learn about the outside world through these other traveling bots and in doing so will unlock spotlight topics that can be addressed with the other Teks to unravel more information. The game sort of feels like playing a choose your own adventure novel, except your choices in how you respond (ranging from snarky to helpful) often don’t make a lick of difference in the grand scheme of things, which is disappointing. As you progress through the narrative, it becomes very clear that the game is pushing some current political footballs. Of course the obvious one being robotic automation and how that could impact the jobs market, but there’s much more going on here. The game tackles human on robot violence, oppressive leaders, slavery, discrimination, immigration, and more. These are some deep topics for any video game to take on, and I do give the developer credit for addressing them. They don’t really seem to tackle any solutions, but just making them part of the conversation is commendable. This being a sort of interactive visual novel, there’s not much to be said about the game’s graphics or music. For the most part you’re stuck in one area looking at the same backgrounds, but at least the various robots change. The models look nice, but there’s not enough variety here to make much of an impact. You’ll mostly be staring at the text on the screen anyway. The music is actually pretty good, with a futuristic vibe that I appreciate. It’s very Mass Effect-like in its composition. The game isn’t voiced, so be prepared to read – a lot! 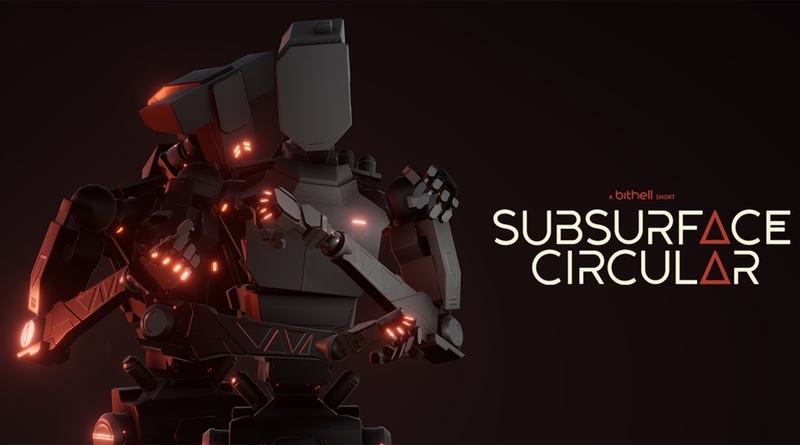 As I mentioned earlier, Subsurface Circular isn’t going to be for everyone. If you like to read and enjoy a sci-fi bend on a classic detective story, then you’ll most likely want to check it out. Although I enjoyed my time with it, I could just as easily see someone getting bored after a few minutes. There’s nothing else quite like it on the Switch, and its low price of entry will hopefully open up some gamers’ eyes to new possibilities to explore interactive entertainment. Subsurface Circular is a unique storytelling device and one that gives the illusion of player choice, when in reality the narrative is rather linear in nature. The gameplay is purely dialog tree choices consisting of various questions and answers. It won’t be for everyone, but it’s great to see a deviation from typical game design. Subsurface Circular was reviewed using a final retail Nintendo Switch download code provided by the publisher.